I’ve been working a couple times each month at this cute Japanese jazz place for several years now - It used to be this sweet, sleepy little room. A handful of Japanese and Japanese-American types having a cocktail and a sizzle platter while Frank or Ed shows us how it’s done, and I sing a program I like to call "Because I Said So, That's Why." Well, now little Tomi Jazz is getting all famous. Because the cream rises to the top, is why. This is a great bar. You should go (me or no me — they have 3 acts nightly, it’s awesome). Definitely reserve; forget it otherwise. No reservation, no getting in; Tomi is simultaneously wee and popular. It's on 53rd between 2nd & 3rd, closer to 2nd. When you can't find it because nobody can, it's directly across the street from the Peking Duck House. Look underneath the barber shop, down a flight of stairs by the barber pole. Don’t be scared of the buzzer, it’s insanely hip, no kidding. 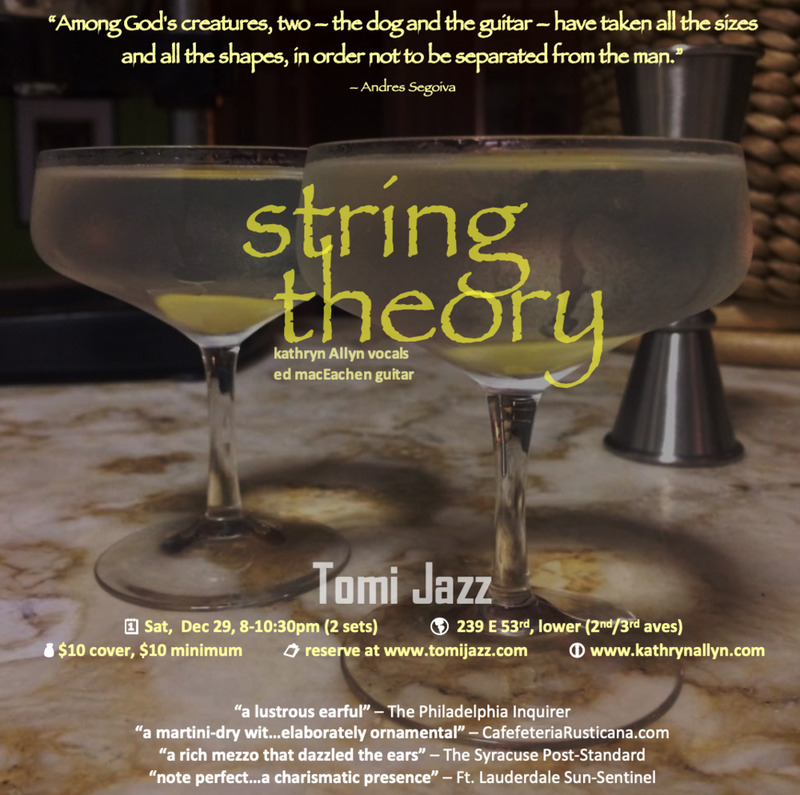 String Theory is delighted to play the nicely intimate room at Bar Thalia. This is a 46-seat cocktail bar with a good American menu, on the lower level of Symphony Space. It’s a relaxed setting, and really nice for me to play so close to home…walking to the gig = winning. In addition to Thalia’s jazz schedule, check out the comedy nights, poetry readings, wine tastings and other events, HERE. And there’s always a special — Saturdays, it’s $8 vodka cocktails. Which, I mean, more winning.